I've enjoyed working through the multitude of inspiration in this summer's Camp Scrap 2013 workshop, which officially ended on July 3rd. I did a pretty good job of reviewing each week's materials during the workshop, however there was so much inspiration that I knew I would need time to review and act on it once class was over. One of my favorite aspects of this class is how May Flaum set it up just like a summer camp. Each week she provided three mini-classes (like workshops you would sign up for at a summer camp) complete with a video and a handout. That's 12 mini-classes within one workshop! In addition, each week included a Make & Take video, daily emails with inspiration and challenges, and an active message board where May occasionally posted extra challenges and links. I also enjoyed the variety of projects (multi-media canvases, scrapbook layouts, cards, mini-albums, journals, etc) and techniques (stamping, inking, using "bad" photos, including memorabilia, etc) included in this class. 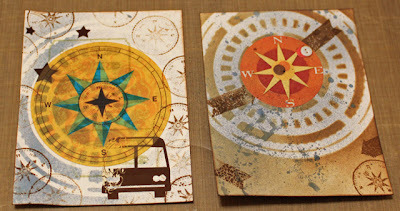 I created these two travel themed pieces after watching a video where May used stencils and inks and stamps. In addition to these pieces, I have so far created 7 layouts, 6 cards, and 1 travel journal. I'll be sharing a few of my favorite techniques in a future post, and I have a list of ideas and plans for several more cards, layouts, and a multi-media canvas based on the mini-classes. 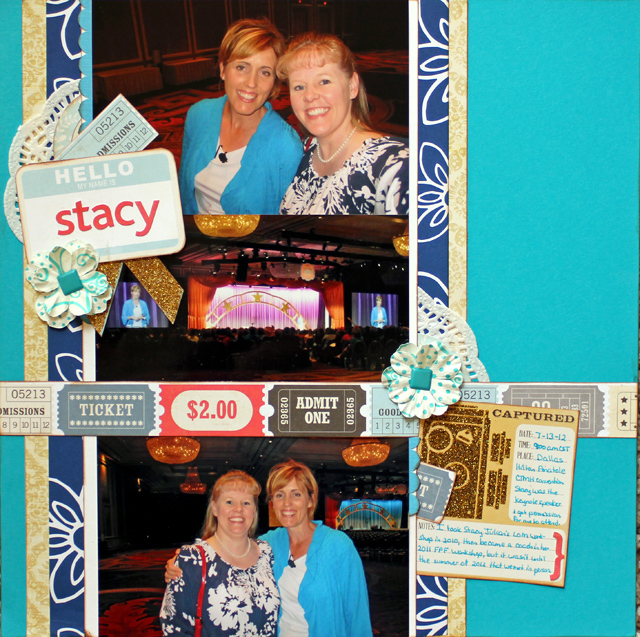 Here's a look at a layout based on one of the week two mini-classes about layering on scrapbook layouts. This class was a great value at $29, however I was fortunate to have a $10 BPC Reward and only paid $19 for four weeks of creativity that included 23 videos (averaging 15+ minutes each), 14 handouts, and 28 emails (filled with 54 new projects according to May's count), plus the additional challenges, links, inspiration and interaction on the message boards and in the gallery. Great class review. Thanks for posting it. The class was clearly great value as well as enjoyable with lots to stimulate creativity as your pages show. Thank you for the info - it is always good to get feedback from someone who has personal experience. Cute page with you and Stacy. I look forward to you sharing more of your camp experience. Beautiful work Melissa! Love it! You and Stacy are so cute together! You lucky ducky! Sounds like an enjoyable class. Where did you meet Stacy? Looks like a casino lobby! Love the photos of you and Stacy! May is a very popular teacher, it's easy to see why. Thanks for the review! Remember That First Inspiration Day?